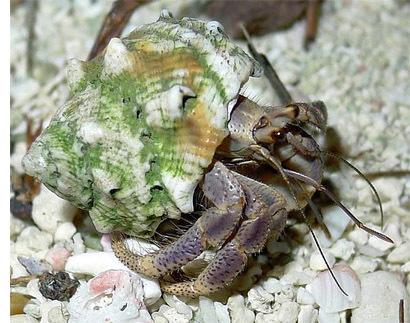 The most common local resident on Long Caye is the hermit crab. They are terrestrial crabs that inhabit the island by the thousands, and although nocturnal they are encountered at all hours of the day, everywhere. Most of these hermit crabs inhabit the shells of the West Indian Top Snail (Cittarium pica), a large snail found in the inter-tidal zone on the shores of the island. Hermit crabs are seen in all stages of growth, from miniscule juveniles to giants that are several inches across. They crawl along endlessly, hardly ever stopping, scavenging for food. Their tracks are seen in the sand everywhere, with the shells leaving drag marks. Hermit crabs have a very effective defense system. If threatened they retract inside their shell and present a sealed, armored body, barely protruding from the opening, with only their formidable claws exposed and ready to snap at anything nearby. 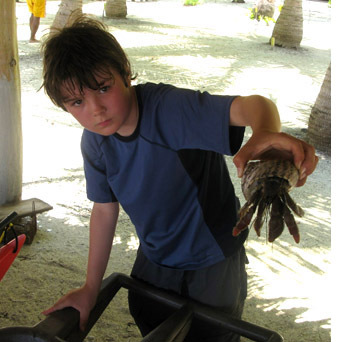 One has to be careful when handling these crabs, since their incredibly strong claws can easily cut through a finger. As a hermit crab grows, it needs to find a new shell to accommodate its bigger body. However, since they don’t make their own shell, they have to find a new one. There are almost no empty shells lying around, virtually every shell on the island is already taken (and we occasionally find crabs in other homes, such as shampoo bottles, small light bulbs, champagne corks, and other odd trash). So when new shells are needed, the crabs will select one unlucky, large, individual and gang up on him. Working together the smaller crabs extricate him from his shell and leave him unprotected. This frees up a large shell and the victim soon dies. Once that shell is free, all the other crabs in the group move up to a larger shell, leaving only the smallest one free which is quickly occupied by another crab not originally in on the exchange. We often see these ‘gangs’ of crabs in small heaps, going through this process. Hermit crabs serve an important function on the island; they compost all of our kitchen scraps for us. All food scraps are taken to the island dump and piled in a huge mound. This pile could take over the island if it weren’t for the crabs turning them to dirt, little-by-little. Also at night the crabs do a “patrol” of our dining hall floor, and leave it completely clean for the next day. If you are up early, you will see their tracks all over this sand floor. 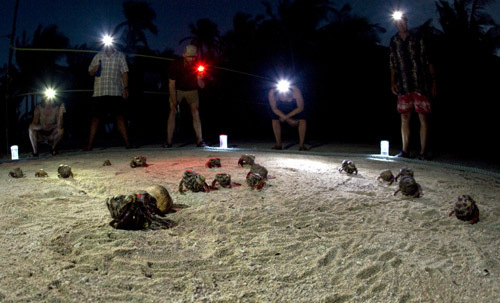 Every Friday night we host a Hermit Crab Race, a great way to end a fantastic week. This event is hugely popular, you will be amazed to see the excitement this generates!